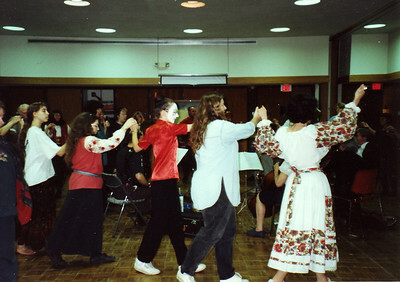 Panharmonium plays international music for folk dancing. 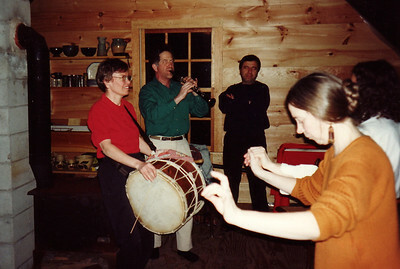 We are the "house band" for Amherst International Folk Dancing (see AIFD website). This album includes images from 1993-2013 --twenty years! June 18, 1993. 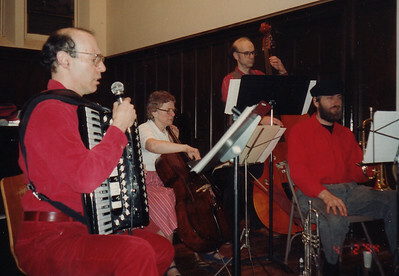 We weren't yet called "Panharmonium." 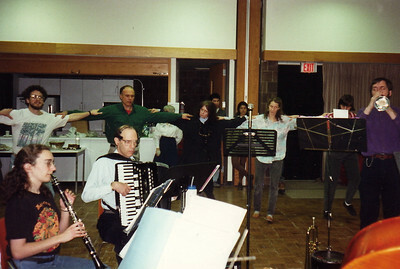 The live music nights were simply "Bring your own instrument" events, open to anyone who knew the folk dance tunes and wanted to sing along or play along with Gene. April 2, 1994. 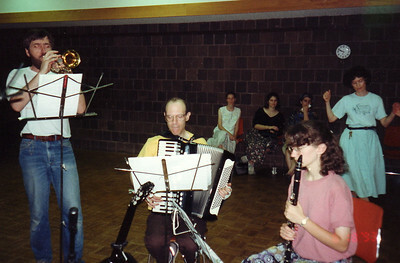 Sharon and Yaron on clarinets. August 19, 1994. 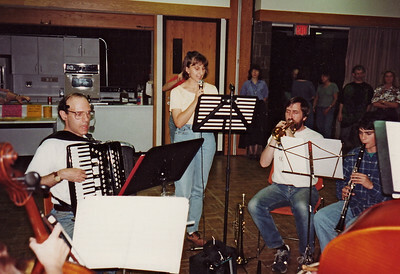 Clockwise from bass player Joe Blumenthal, Gene Goldwater, Toni Krushevska (singing), Ken, Steve Churchill? 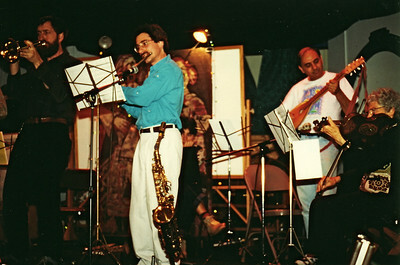 (violin), my drum on floor, Sharon Goldwater (clarinet), Premjit Talwar. Bring-your-own-instrument night at AIFD. 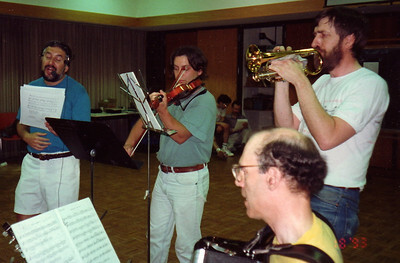 October 1994. October 1994. 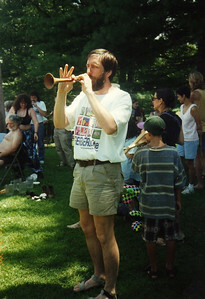 Andrea Ujvari singing. January 6, 1995. 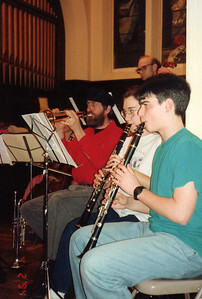 David Schonfeld, left, on clarinet, (Sharon? 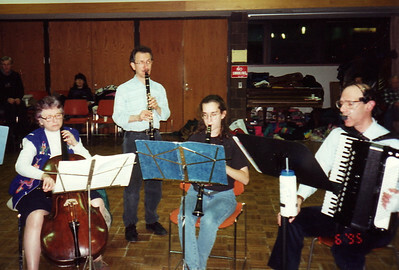 seated, playing clarinet), Andrea, Ken, Henry Speno (sax), Miriam Leader (violin), Joe, and Sabina (cello). January 1995. 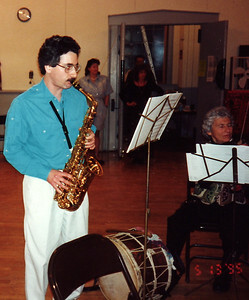 Sabina Braunthal, David Schonfeld. 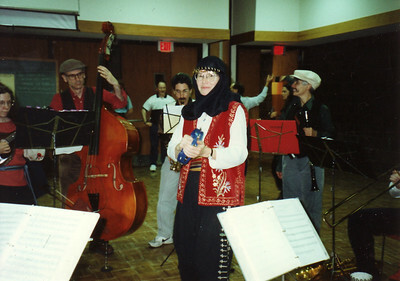 Sharon Goldwater. Gene Goldwater. March 1995. 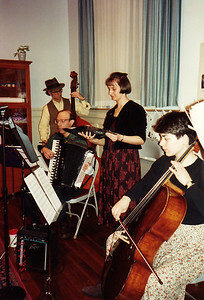 Panharmonium played at the cocktail hour before a Transylvanian dinner at the Unitarian Society. 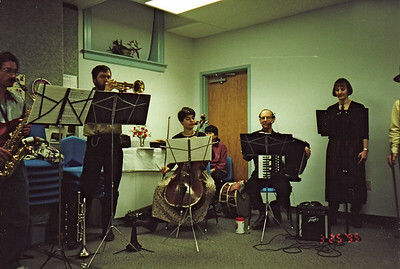 We also played after dinner (next photo). 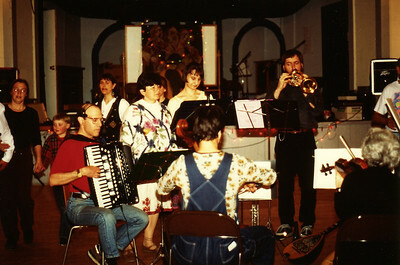 In 1995 some of us attended Balkan music jams in Becky Ashenden's attic. Delightful! 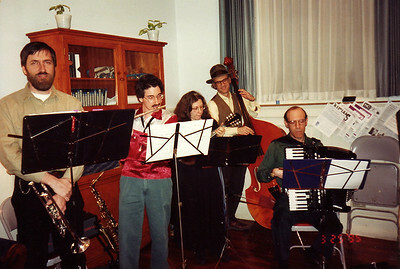 Balkan music jam in Becky's attic, April 1995. Lila, Jenny, Kate, and Becky. 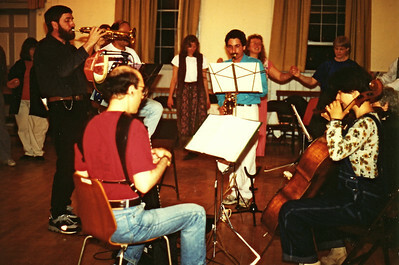 Panharmonium gig in Troy, N.H. May 1995. 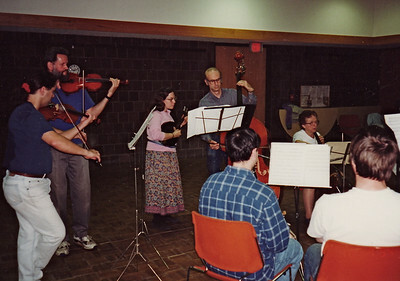 Guest cellist, Irene. 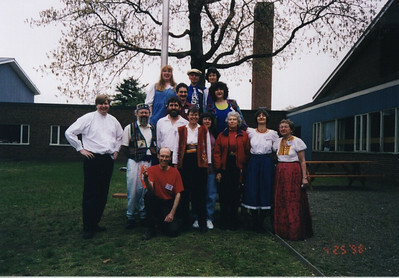 Panharmonium gig in Troy, N.H. May 1995. Gene, Toni, Andrea, Ken,... Miriam, Irene. Kate Thomas and son dancing behind Gene. 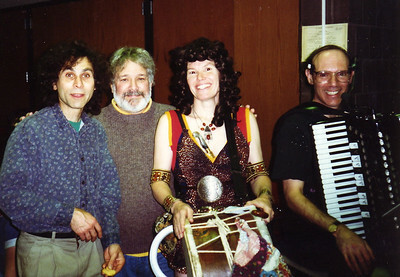 Panharmonium gig in Troy, N.H. May 1995. 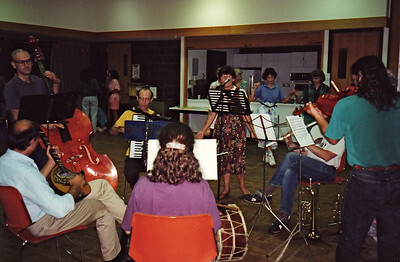 Music party to celebrate Ken's 40th birthday, Sept. 3, 1995. 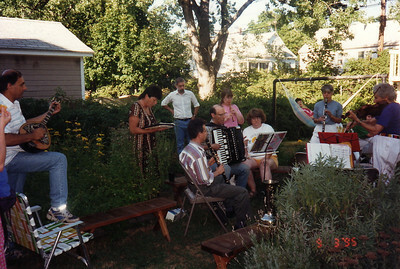 This was the first of many music parties at Ken & Sandy's new home in Holyoke. 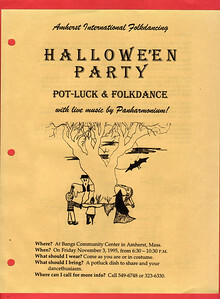 Halloween dance and party, Friday November 3, 1995. Singers Cindi Huss (in black), Andrea, and Dinah. 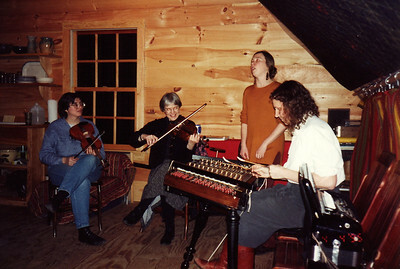 Barbara Blumenthal on mandolin. 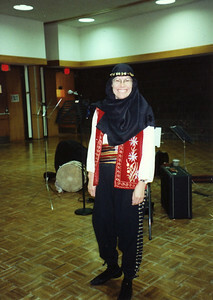 Sandy in Turkish outfit. Nov 3, 1995. 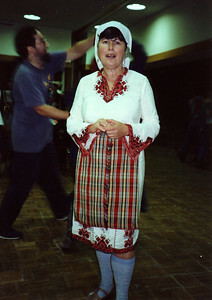 Toni in Bulgarian costume. November 3, 1995. 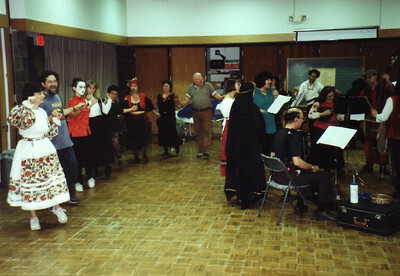 Halloween dance and party, Friday November 3, 1995. 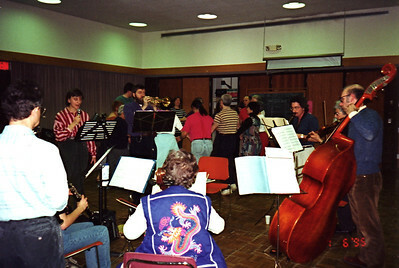 Panharmonium playing in center. 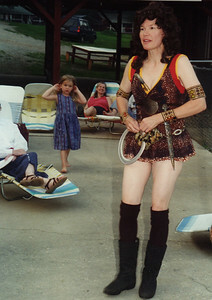 Xena made a surprise appearance in Amherst at the 1996 Halloween party, just after Joe asked, "Where's the drummer?"